If You are using a reduced base circle camshaft or changing valve tip height, you need to maintain the HLA's same .040"-.050" clearance operating range. These hardened steel shims are the perfect solution. 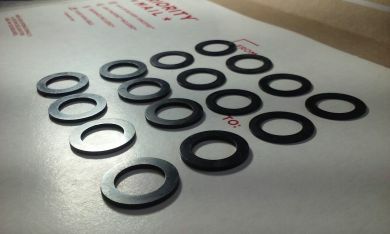 Each set comes with 8 .030" shims and 8 .060" shims for a total of .090" adjustment for each HLA. Instructions are included as well on how to properly set up HLA clearances with these shims.